We are blessed an abundance of amazing restaurants here in Portland. One of my very favorites is Tasty N Alder and I find myself often trying to replicate some of their dishes in my own kitchen. John Gorham has three restaurants in town and it’s hard for me to decide which one is my favorite. He has a knack for taking traditional dishes from around the world and putting his own special spin on them. If you ever find yourself in Portland I would highly recommend seeking one out. 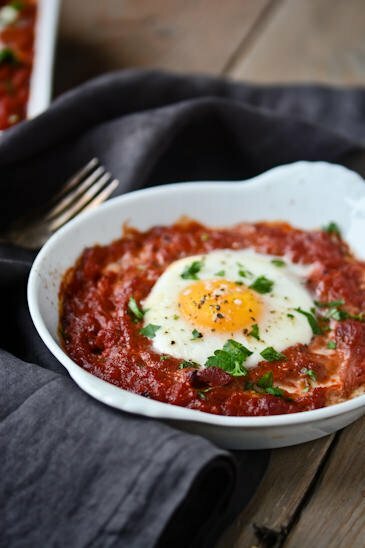 I was lucky enough to find this recipe online for their version of shakshuka, an Israeli tomato and baked egg dish. This is a meal that is as great for breakfast as it is for dinner. We’ve also made a version where I tucked in a few links of spicy sausage into the sauce. Serve it with a few slices of crusty bread and dinner,or breakfast is served! From: tasty n sons This dish from John Gorham's Tasty and Sons is a wonderful version of an Israeli classic. 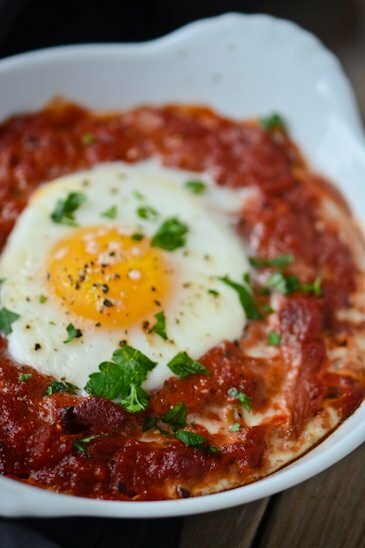 Sweet tomatoes, spicy peppers and barely baked eggs make the perfect breakfast or dinner. 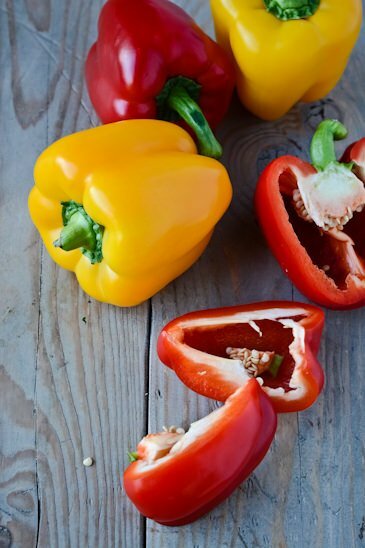 Roast the peppers by placing them on a hot grill or hold them over a gas flame on the stove until black and blistered on all sides. 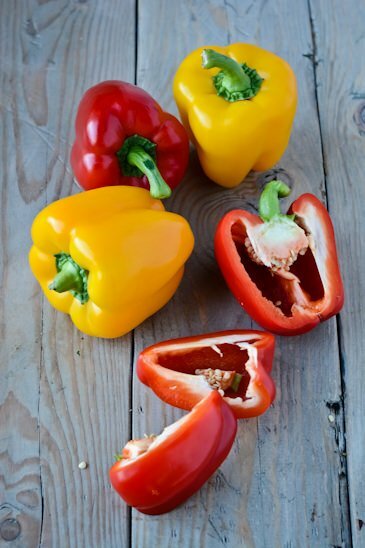 Transfer the peppers to a large bowl, cover with plastic wrap and let steam for 15 minutes. Peel, seed and stem the peppers. Thinly slice and set aside until ready to use. In a large, ovenproof skillet, warm the olive oil over medium heat. Add the onion and the garlic and cook until the onion becomes translucent, about 5 minutes. Add the green and red peppers and cook for 2 minutes. Add the paprika, piment d'Espelette, sugar and bay leaf and cook, stirring occasionally, until fragrant, about 2 minutes longer. Preheat the oven to 400˚. Add the tomatoes and their juice to the skillet and bring to a simmer. Reduce the heat to low and simmer, stirring occasionally, until the tomatoes break down, about 20 minutes longer. Discard the bay leaf and season with salt and pepper. Bring the sauce back to a simmer. Crack the eggs over the sauce so that they are evenly distributed across the surface. Transfer to the oven and bake until the egg whites are set but the yolks are still soft and runny, about 7 minutes. I’ve been wanting to try baked eggs for awhile now. This looks like a great recipe, I pinned it and will try it soon. Thanks for the recipe! Let me know what you think if you get the chance to try it. We had it for dinner the other night and didn’t have any leftovers! 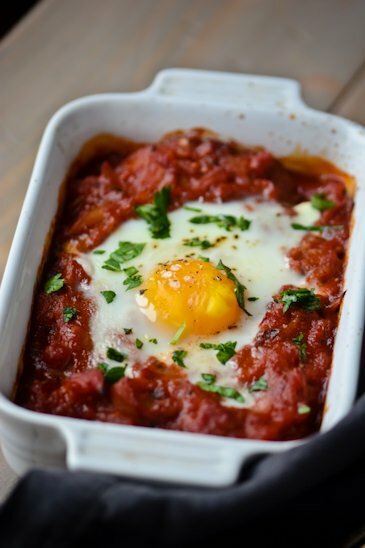 I love Shakshuka, and this version where the eggs are baked in the oven instead of poached on the stove is a fun twist. I could also see socca being a nice bread alternative to serve with it. Thanks! I can’t wait to try this! I love Tasty N Sons! Thanks for the recipe. I could eat there everyday if I didn’t need to fit into my pants any longer. It’s hard to me to decide if I like Tasty N Sons more or Toro Bravo! I know, it’s one of my favorite restaurants, I never get tired of eating there! 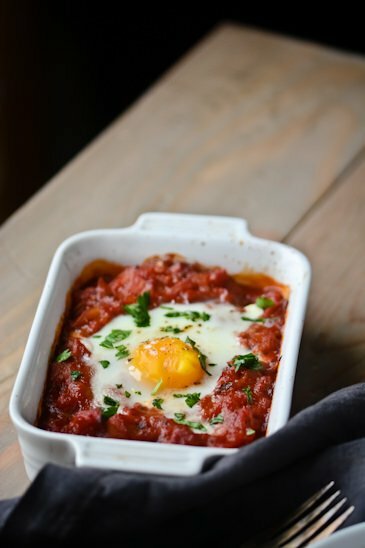 I hope you enjoy the Shakshuka if you try it, I did my best to recreate it!